Play N Go are steadily expanding the number of online slots connected to their progressive jackpot network and we are pleased to bring you news of Piggy Bank, the latest addition to the line up. The theme is that porcelain pig where you stored your money when you were a child and this particular pig is one of those awkward ones which need to be smashed to get to the cash inside. Piggy Bank is a five reel slot with just five fixed paylines and there’s a very cartoonish atmosphere to proceedings; the reels are set against the backdrop of a child’s bedroom and it’s all very colourful. J, Q. K and A are the basic symbols and there are four higher value ones – a hammer, a gold coin, some banknotes and the game’s logo. In addition we also have a pig scatter, another pig bonus symbol and a gold ring which is the key to the progressive jackpot. 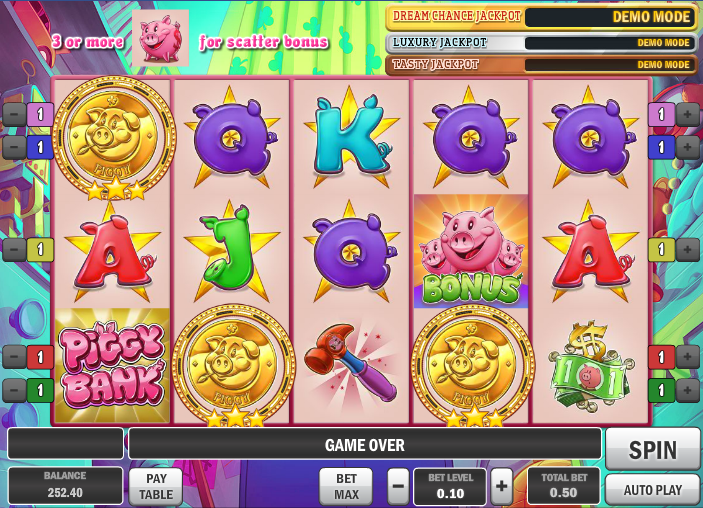 This mini-game is triggered by landing three or more of the pig scatter symbols anywhere on the reels. You now have to pick one to smash which will reveal your cash prize. It’s also possible that you will be allowed to smash more of the pigs for a bigger reward. Three or more of the bonus pig scatter symbols anywhere on the reels will kick this round off. You will now be taken to a screen with a number of piggy banks and a ‘luck meter’ on the right hand side. The luck meter is gradually filled up during the base game whenever you land a bonus symbols on the reels. Now just start smashing those pigs for a reward – each smash reduces the amount of luck left and when it’s all gone the game is over. Check it out in the video above. Three Gold Rings – play the bronze wheel with a chance to win the Tasty Jackpot, cash or a move to the silver wheel. Four Gold Rings – play the silver wheel for a chance to win the Tasty Jackpot and the Luxury Jackpot, a cash prize or a move to the golden wheel. Five Gold Rings – play the gold wheel for a chance to win the Tasty, Luxury and Dream Chance Jackpots. You can see the respective totals for the jackpots above the reels. After each win you can take a chance and try to double or triple that amount by clicking the appropriate buttons underneath the reels. As with many progressive jackpot slots, the more you wager the higher your chance of actually winning one of those big sums of money. Increase your bets a little if you feel confutable doing so. This is another great slot from Play N Go; it might only have five paylines but the other features are triggered regularly enough so there’s always some action going on somewhere. Well worth a go.